(Nanowerk News) To power a car so it can travel hundreds of miles at a time, lithium-ion batteries of the future are going to have to hold more energy without growing too big in size. That's one of the dilemmas confronting efforts to power cars through re-chargeable battery technologies. In order to hold enough energy to enable a car trip of 300-500 miles before re-charging, current lithium-ion batteries become too big or too expensive. In the search for the "post-lithium-ion" battery, Associate Professor of Chemistry Dunwei Wang has been developing materials that might one day enable the manufacture of new batteries capable of meeting power demands within the size and cost constraints of car makers and other industries. 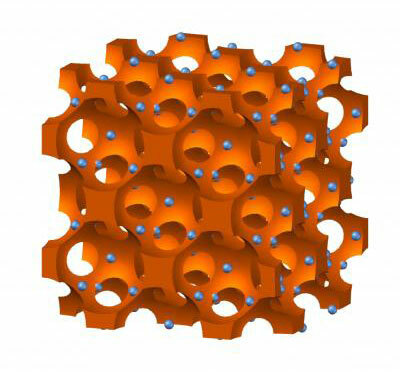 In a recent report published in the German journal Angewandte Chemie ("Three Dimensionally Ordered Mesoporous Carbon as a Stable, High-Performance Li-O2 Battery Cathode"), Wang and a colleague from the University of Massachusetts Amherst unveiled a new method of stabilizing carbon - a central structural component of any battery - that could pave the way to new performance standards in the hunt for a lithium-ion components. Central to the search for improved performance is the ability to shed weight and costly chemical components. Researchers pursuing a "lithium-air" battery have focused on a chemical reaction of lithium and oxygen, which can be pulled from the air. But the materials used to generate this reaction have shown poor life cycles, lasting through just a few charges. The culprit, said Wang, is the instability of carbon, an essential structural support to a battery's electrode, a conductor where charges collect and dispense. "Carbon is used in every battery because it has that combination of low cost, light weight and conductivity," said Wang. "You can't just scrap it." So Wang and UMass Assistant Professor of Chemical Engineering Wei Fan set to work improving the performance capabilities of a newly engineered form of carbon fabricated by Fan. It's called three-dimensionally ordered mesoporous (3DOm) carbon and scientists value it for its highly ordered structure. Employing a technique called atomic layer deposition (ALD), the researchers grew a thin coating of iron oxide on the carbon, a step that enhanced the reactivity between lithium and oxygen and improved performance on the charge cycle. Next, they used ALD to apply a coating of palladium nanoparticles, which effectively reduced carbon's deteriorative reaction with oxygen and improved the discharge cycle. Their initial tests on the material showed marked improvement in performance. "We demonstrated that a particular form of carbon can be used to support a new type of chemistry that allows for energy storage with the promise of five to 10 times more energy density than state-of-the-art lithium-ion batteries we see today," said Wang. "We see this as significantly improving the cyclability of the battery, which is a key issue." Wang said the findings show 3DOm carbon can meet new performance standards when it is stabilized. "The key innovation we make here is that 3DOm carbon is stable - we have stabilized something that was not previously stable," said Wang.